Children adore making things, getting crafty and creating their own masterpieces so what better way to celebrate your child’s birthday than with a group of friends learning a new craft and producing a personal piece of art to take home. 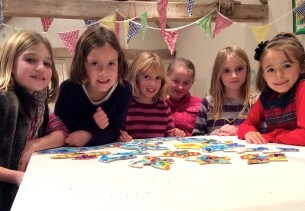 The Emma Leith studio can accommodate a maximum of six children. Or, if you prefer, she can come to your house – within a 10-mile radius of Bath – bringing all the materials and plenty of enthusiastic artistic energy to keep the children well and truly entertained for a birthday party they will not forget. 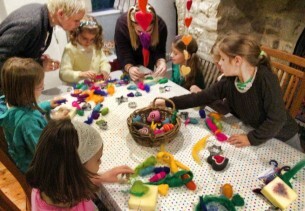 Choose between mosaic and needle felting with each party offering an hour and a half of enjoyable making! 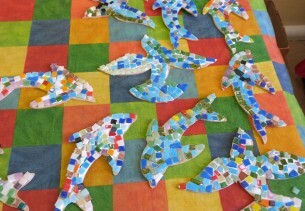 Mosaic parties allow each child the opportunity to work with pre cut authentic mosaic tiles to create bird, dolphin and star mosaics. Emma takes the mosaics away to grout and polish them before carefully wrapping each one ready for collection at your convenience. Needle Felting parties are a popular choice and include a party bag for each child bursting with everything they need to continue their new found skill after the party has ended! Contact Emma Leith to book a dream birthday party! Let Emma know if you have a specific date in mind! Thank you for your enquiry, Emma will get back to you as soon as possible to talk about your birthday party.